Paul Ryan will retire from the House this November. He leaves behind him a legacy as a fraud, capable of attaining his legislative priorities only by swaddling them in white supremacy. Praised by elites as a wonk, his policies enjoy virtually no support in the mass public, and indeed, during his tenure as speaker, public appetite for government spending has increased dramatically. Paul Ryan leaves behind him a legacy as a fraud, capable of attaining his legislative priorities only by swaddling them in white supremacy. Though he entered Washington praised by elites as a wonk capable of selling the conservative policy agenda through data, charm and intelligence, he leaves with this charade stripped away. His policies enjoy virtually no support in the mass public, and indeed, during his tenure as speaker, public appetite for government spending has increased dramatically. What little success Ryan achieved in upward redistribution, it was not through skillful legislating or popular appeal, but rather by crafting a strategic alliance with a party more concerned with creating a white ethnostate than balancing the budget. Paul Ryan's legacy has been sealed since he unveiled his first budget plan in 2011. Equal parts tax cuts for the wealthiest and benefits cuts for the poorest, his plan shot him to superstardom in conservative circles, and earned him praise from an adoring press that labeled him a wonkish wunderkind. But his star peaked when he was named Mitt Romney’s running mate, and has faded into ignominy as he has consistently capitulated to Donald Trump, the administration’s lackey’s in Congress, and the white supremacist members of his base. Ryan isn't just loathed by liberals, he's quickly lost support among Republicans along the way, who overwhelmingly adopt Trump's style of politics, not Ryan's. He leaves Congress with a 5% favorable rating (compare to Putin at 3%) and a 21% somewhat favorable rating. 38% of Americans have a very unfavorable view of Ryan and 21% a somewhat unfavorable rating (the rest didn’t know) which is no surprise given the derision he inspires on both the left and the right. 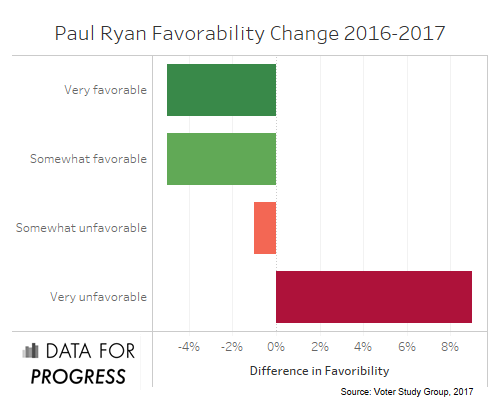 Ryan also has dismal support among Republicans: only 12 percent of Republicans have “very favorable” views of him, roughly the same share of Republicans who have a very unfavorable view of him. Two percent of Independents and 1 percent of Democrats have a “very favorable” view of Ryan, while 36 percent of Independents have a “very unfavorable” view, along with 60 percent of Democrats. Ryan’s unpopularity is not new, even if its direct causes might be. Even when he came to the fore in 2011--helped by a distasteful amount of hagiography from political pundits labeling him a policy wonk savant--his Ryan Plan, laden with cuts to the taxes of the wealthiest and the healthcare and social security of the poorest, was broadly unpopular. No aspect more so than his proposed cuts to Medicaid. And now--after 18 months of Republican assaults on the Affordable Care Act, Democratic counter proposals including Bernie Sander’s Medicaid for All proposal, and the exposure of the utter cruelty and senseless of several Governor's refusal to expand Medicaid now that they no longer have Barack Obama as a foil--Medicaid expansion is rapidly gaining momentum in red states. Between 2016 and 2017, Trump’s “very favorable” rating among Republicans increased by 3 points (from 54 percent to 57 percent) while Ryan’s fell from 19 to 12 percent. Ryan’s “very’ unfavorable rating increased from 7 percent to 12 percent, while Trump’s fell slightly. Ryan’s policy agenda has never garnered national support. In the 2014 Cooperative Congressional Election Survey, respondents were asked whether they would support or oppose the Ryan Budget, described to them as legislation that would “would cut Medicare and Medicaid by 42%. Would reduce debt by 16% by 2020.” Only 24 percent of the general public supported Ryan’s budget. 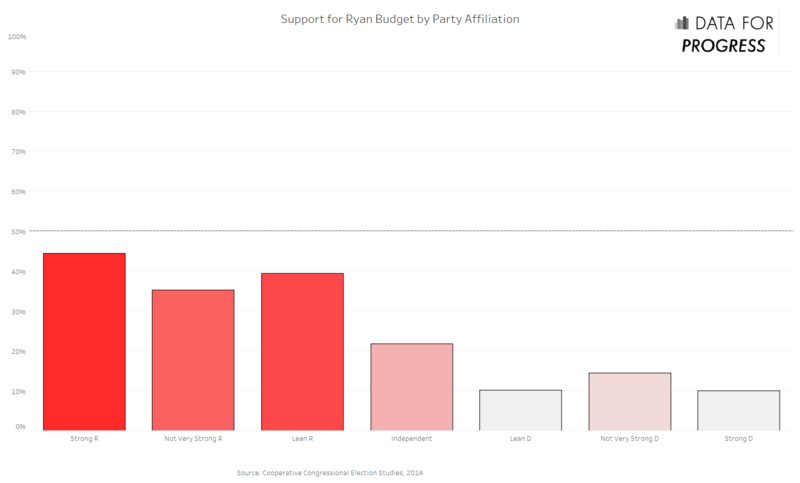 Even among individuals who identified as “Strong Republicans,” only 44 percent expressed support for Ryan’s Budget. His budget had below 50 percent popular support with every political affiliation, even people who listed themselves as Strong Republicans. Ryan’s budget was popular with a particular subset of Republicans, specifically those making above $80,000 per year, tracking upward with wealth, until reaching 68 percent with GOP voters making more than $250k. Given this low baseline and isolated support, we should expect any candidate who openly runs on the Ryan agenda to have difficulty winning elections. 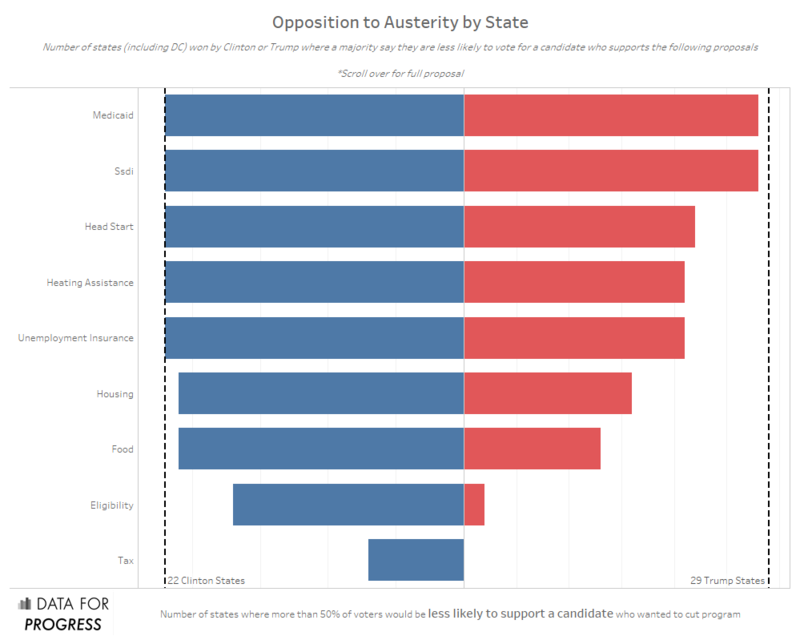 Data for Progress estimated how people in specific states felt about Ryan-style austerity using a technique called Multilevel Regression and Post-stratification (MRP). The data we analyzed comes from a Center for American Progress poll conducted in January of 2018 asking respondents whether a candidate’s support for various policy positions would change the likelihood of the respondent voting for that candidate. The policies polled included the Republican Party’s tax cut (TCJA), generic questions about cuts to the social safety net, and inquiries about cuts to specific federal programs. While opposition to the generic social safety net cuts and Ryan’s tax bill tended to be stronger in blue states, cuts to specific programs yielded broad opposition. Based on this data, we estimate that majorities in both Clinton and Trump states are averse to cutting critical social spending programs. In 22 out of the 22 states (including the District of Columbia) that voted for Clinton, and 28 out of the 29 states that voted for Trump, majorities would be disinclined to vote for a candidate who wanted to cut Medicaid or Social Security Disability Insurance (SSDI). Furthermore, in all states that voted for Clinton, majorities said they would be less likely to vote for a candidate who supported cutting Unemployment Insurance (UI), heating assistance, and Head Start, and in all but one state the voted for Clinton a majority of voters said the same about Food Stamps and housing programs. Similarly, in over 20 of the 29 states that went to Trump, majorities said they would be less likely to vote for a candidate supporting cuts to UI, heating assistance, and Head Start. 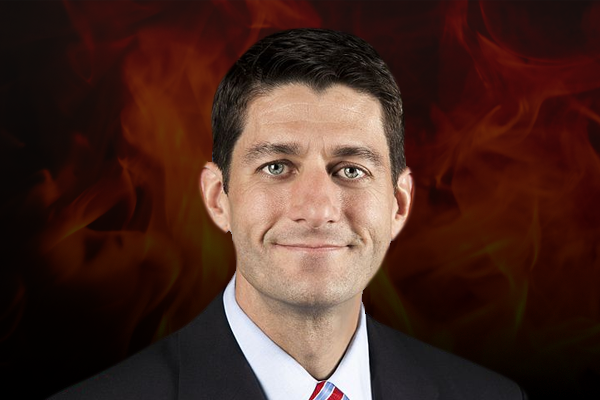 Our analysis is substantiated by recent national polls on the specifics of the Ryan agenda. Ryan’s budget proposals have always entailed draconian cuts to the country’s largest entitlement programs and a rash of national surveys since the election suggest these proposals remain deeply unpopular. According to the American National Election Study, only about 6 percent of the public thinks that Social Security should be cut, an order of magnitude less than the 60 percent who say it should be expanded. Cuts to other programs are deeply unpopular as well. According to a 2017 poll by the Voter Study Group only 24 percent of the public favors repealing Obamacare and its dramatic expansion of Medicaid. Even among Republicans, only 11 percent strongly favor repeal, whereas 18 percent are strongly opposed to doing so. 22 percent of Clinton voters and 48 percent of Trump voters agree that, “lowering taxes on the highest-earning Americans will help grow the economy." 97 percent of Clinton voters and 78 percent of Trump voters agree that "making sure the wealthiest Americans pay their fair share in taxes will help grow the economy”. 91 percent of Clinton voters and 74 percent of Trump voters support the Buffet Rule, requiring people who earn more than one million dollars per year to pay at least 30 percent of their income in federal taxes. Ryan cut taxes for wealthy people dramatically, despite the fact that voters already thought the rich paid too little. No liberal will celebrate the decline of Ryanism if it means the rise of Trump. But wider context offers hope. 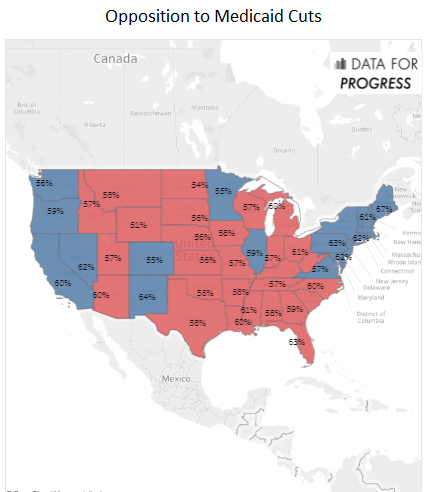 The data suggests that modern progressive policies are widely popular nationwide. Even with Ryan’s retirement, the progressive agenda still faces strong headwinds in the form of voter suppression and other undemocratic forces--many championed by Ryan himself. The challenge of overcoming these forces is compounded by insurgent nativist and racist sentiments powered by Donald Trump. But the fact remains that Paul Ryan has always been fighting political gravity, and in achieving his greatest policy win, he has ensured his own irrelevance.